Before getting into the meat of this post... I should note that this blog is not generally about spacecraft. Normally it contains posts related to Oracle certification. As it happens, I am also very interested in space, and the current drive for reusable space launch systems. In this instance, my blog is just a reasonably convenient place to post an analysis I created about the United Launch Alliance (ULA) Vulcan and the SpaceX Falcon 9. If you are a space enthusiast... don't bother bookmarking this blog... it will seldom be about space. If you're an Oracle certification candidate, ignore this post... unless you also happen to be interested space launch vehicles. Because of my interest in reusable launch systems, I have followed the activities of SpaceX closely for a number of years. By the same token, I also follow Blue Origin... although I'll be much more interested in them once they make the move beyond sub-orbital boosters. When ULA announced that their proposed Vulcan launch vehicle would be partially reusable, I was (briefly) interested in it -- although one look at their proposal damped much of my enthusiasm. The convoluted plan that ULA devised in order to reuse just the engines of the Vulcan first stage seems to involve a significant design effort for a minimal return. At best it is an evolutionary step in reusable launch technology when both SpaceX and Blue Origin are working towards revolutionary steps. A few days ago, an article I read reminded me of the Vulcan and prompted me to check if there was any recent news about it. While searching, I ran across a white paper from ULA: Launch Vehicle Recovery and Reuse. The paper is an interesting read -- in particular the analysis used to sell the notion that the Vulcan Sensible Modular Autonomous Return Technology (SMART) plan makes economic sense. The chart to the left comes from section 7 of that document: Economics of Reuse. In this section, the authors explain why SMART would be more effective at reducing launch costs than the booster flyback concept of SpaceX. 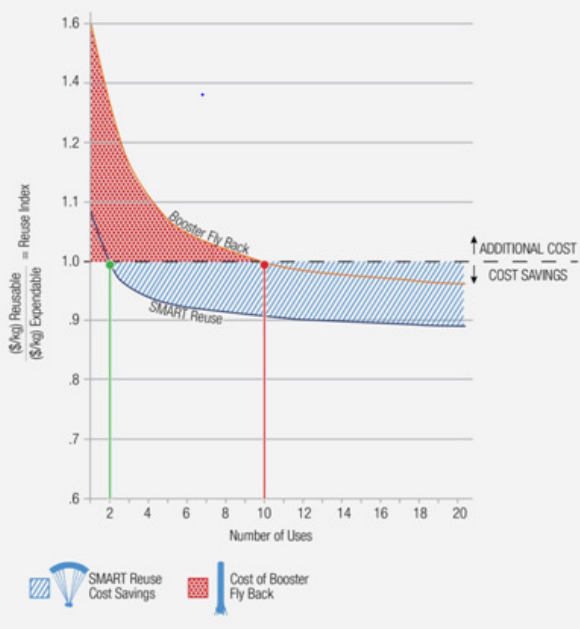 According to the paper, the chart demonstrates that SMART will reach break even when compared to a comparable expendable booster at the second launch and subsequent reuses would drop costs to about 90% of an equivalent expendable booster. By contrast, it purports to show that the Falcon 9 flyback concept does not break even until the tenth use and never matches the cost reduction of the SMART concept. 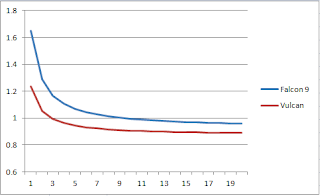 The formula that ULA used to generate the graph is shown in the image below. Unfortunately, while the white paper notes that the accuracy of the information generated by the formula is highly dependent on the values used in it, the paper does not actually provide the specific numbers used to generate the chart. The readers are presumably intended to accept that the authors chose reasonable values. Since I don't like making assumptions, I created a spreadsheet that contained the above formula along with cells for entering the relevant parameters for both the Vulcan and the Falcon 9. 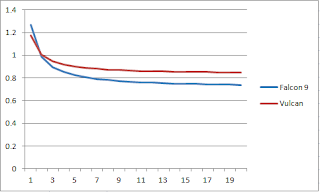 While I had to estimate values for both vehicles using data available online from SpaceX and ULA, I was able to tweak the results until I came up with a result that matches the ULA white paper reasonably well (chart to the right). It is a given that I do not have the exact numbers they used in the white paper (especially since the Vulcan exists only on paper). However, I am reasonably confident that my numbers are not ridiculously far from what the ULA authors used. As with the ULA results, the Falcon starts with a reuse index of about 1.6. (which indicates the launch of an Falcon 9 that performs a first stage flyback costs 60% more than that of an expendable booster with the same performance). 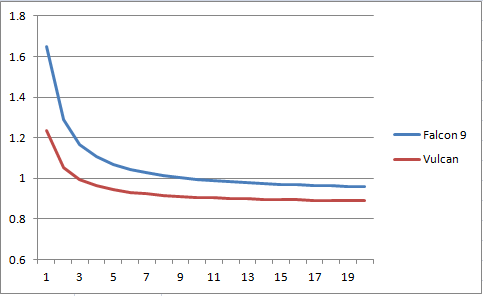 The F9 breaks even at ten uses, and never gets better than about 5% lower in cost than an expendable booster. By contrast, the SMART tech breaks even at the second use and rapidly drops to about 89% the cost of an expendable booster. While I'm certain that viewpoint is an attractive one to the ULA team behind the SMART concept, it does not mesh with reality. The Falcon 9 missions seldom make use of 100% of their rated capacity. If an expendable booster only uses 70% of its rated capacity to launch a given payload into its designated orbit, the costs for the launch are not reduced by 30%. By the same token, launch costs would not increase by 30% if an equivalent reusable launch vehicle required its full rated capacity for the same payload. It is true that there are additional performance-related mission costs for a flyback mission when compared to one with an expendable first stage -- notably additional propellant. However, Elon Musk has indicated that propellant costs are less than half a percent of the total mission costs. In any event, the cost of that additional propellant should be included in the C(RR) variable of the equation. Arbitrarily increasing the mission cost because the reusable tech decreases the maximum potential mass-to-orbit is madness. For that matter -- it makes no more sense when applied to SMART than it does for the flyback option of SpaceX. However, it favors the SMART concept because the additional mass required for the parachutes, inflatable decelerator, and engine separation mechanism has a lower impact on the total mass-to-orbit than the flyback option. I can accept the reduced mass-to-orbit capacity caused by adding reusability features to a launch system having a tangible cost impact if it were to put a payload outside the rated capacity of the launch vehicle. This could require the payload to be launched on a larger (and more expensive) booster. Of course this would require mission planners to blindly decide that since the Falcon 9 cannot launch the payload to the required orbit and accept the performance penalty of the first stage flyback -- that the mission would simply have to be launched using the F9-heavy at a higher cost. The logical flaw in this thinking is obvious. Nothing says that SpaceX cannot simply launch such a payload without recovering the first stage. A mission like this might well make use of a first stage that has been used on several previous flights and is approaching the point where it is not feasible to refurbish. The ULA equation looks fairly reasonable... minus that one variable. 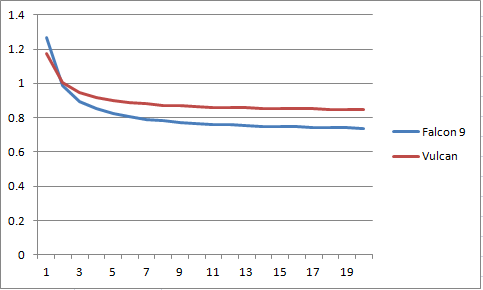 Once p is removed from the equation -- the same values that generated my first chart above return the results in the chart to the left. Using this logic -- both options reach parity with an expendable booster on the second use. Additional reuses show the flyback option to save more money than SMART. Even then -- I'm confident that the numbers I chose in order to make the first chart results match the one in the white paper are using values that artificially inflate SpaceX's costs. Elon has indicated that he expects F9 missions using reused boosters to be priced at about two-thirds the cost of one with a new booster. Even after twenty reuses, the index with the values I used show a cost of 74% that of an expendable mission. When I put in values that make more sense to me based on the Falcon 9 launch price figures posted by SpaceX, I get results much closer to Elon's prediction. However, those figures cause the first chart to be very different from the white paper. I may well be maligning the authors of the ULA white paper. However, it strikes me that someone who was putting together an equation like this might well have initially developed one that did not contain the performance ratio. After populating the equation, it would have quickly become obvious that even using unfavorable assumptions for SpaceX production and refurbishment costs, there was no way for the formula to make SMART look like a competitive solution. A person in this situation might well have decided that the formula needed a coefficient which would heavily favor SMART. For maximum effectiveness, such a coefficient would need to be a single value that acted as a multiplier on the rest of the equation. The p variable is exactly what was needed in exactly the right place. That seems overly convenient to me. Anyone who is interested in playing around with the analysis is welcome to the spreadsheet I created. The first tab contains the analysis using my best guess at the ULA numbers. In the second tab, I changed the SpaceX numbers to match values I believe are closer to reality. I know that there were some people waiting on me to create a set of flashcards for the 1Z0-144 exam. However, I really wanted to get the administration and upgrade exams out as soon as possible due to the number of Oracle certified professionals affected by the recertification deadline that took effect on March 1st. I will be creating flashcard apps for the 1Z0-144, 1Z0-047, and 1Z0-146 exams shortly. Beyond the expanded OCPFlash exam content available, I have also released the apps to the Google Play store. Anyone who prefers to get mobile apps from there instead of Amazon can do so at this time. Use OCPFlash in the Google Play search bar to find all of the exams currently available. In addition, I will be releasing the OCPFlash series to the Apple store in the near future. At this time I have not yet been in a position to perform all-up testing of my app on an iPhone. I have several Android phones in my family... but no iPhones. The development environment the app was created under has the ability to compile the app for iOS. However, I do not feel comfortable assuming that everything will work flawlessly without having performed testing on actual physical hardware. As soon as it has been tested on an iPhone, I will get the OCPFlash apps out on the Apple Store and make an announcement here. When I created the first two apps for 1Z0-051 and 1Z0-061, they each contained 200 flashcards. In setting a price, I felt that $1.99 was reasonable for a mobile app and that figure also fit neatly with the card count (i.e. a penny per card). Many of the versions I have created since then have a larger number of cards, 225, 250, 300, on up to the monster that is 1Z0-067 which has 400 flashcards. I considered varying the price of the apps by the count of cards, but ultimately decided just to standardize on the original price of $1.99. Therefore, if anyone wonders why some of the apps are priced more-per-card than others, the answer is -- they aren't. Some of the apps are priced less-per-card than others because I like standardized pricing. The OCPFlash card count for any exam will never go below 200, but may be higher depending on the scope of topics that must be covered. At that price, I am confident the vast majority of individuals who make use of the apps will consider it money well spent. 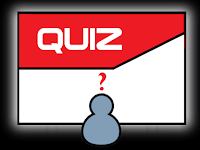 Over the next couple of months, they will be putting out additional quizzes approximately once per week -- if they follow the pattern of the first set. The original quizzes that I provided last year were five questions each. GoCertify requested that I bump the count to a round ten per quiz. I'm flexible... so that's exactly what I did. Ten questions will give certification candidates a small indicator of how well prepared they are for the exam and a bit of insight into the types of questions that they might encounter. They will not get the same level of insight as you would from taking a full-up practice exam... but on the other hand, it won't cost a dime. I will be creating several more Oracle Certification Prep practice tests this year. Once I have a block of four to six new ones, I will most likely supply GoCertify with a third round of quizzes. Each of the questions on my quizzes had their origin in a question from the corresponding OCPrep practice test. However, I modify them all to some degree. None of the quiz questions has the exact same questions and answers as what exists in the practice test. I did not want the quiz to have a significant impact on the experience of taking the full practice exam. If you are interested in getting a feel for the types of questions that appear on the real exams, but have zero interest in spending any money, please check out the quizzes. If the one you need is not published at GoCertify yet... check back in a couple of weeks. Four years ago I published the first of the Oracle Certification Prep study guides -- largely because I felt that Oracle certification candidates did not have enough options in their choice of study materials. There is a tiny fraction of the myriad options that are available for certification exams from Cisco, CompTIA, or Microsoft. Last year I started making practice tests available for the same reason. Prior to this, there were only two vendors of practice tests that offer a high-quality product, and since both are owned by the same company, they are effectively one option. 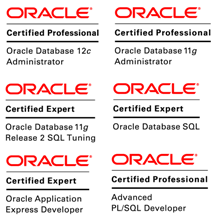 I spend a lot (too much) of my time thinking about Oracle certifications. A fair amount of that time is focused on trying to devise ways of providing certification candidates with more options to prepare for their exams. Late last year one came to me and I have been working on it ever since. Long before I started writing study guides for others, I was creating 'study notes' for my own use in passing certification exams. These notes were basically just three to five pages of important facts, lists, commands, etc. that I felt were likely to be asked about on the exam. As part of my study process, I would read through them multiple times, On the day of the exam. I would arrive at the testing center early enough that I could spend fifteen to twenty minutes going through the notes a final time. This ensured that a fair amount of the information that I would be encountering on the exam was fresh in my short-term memory. Several times in the past four years I have tried to think of a format to reproduce the utility of these study notes for others. Until now, I have been unable to come up with a reasonable delivery method and a way to provide context. The notes were really just brief and cryptic 'answers' to questions I did not bother to write down. They would have been useless for anyone but myself. In December I had an epiphany about a solution to both problems. The level of information that I put into the study notes is a very good fit for the 'answer' portion of flash cards. 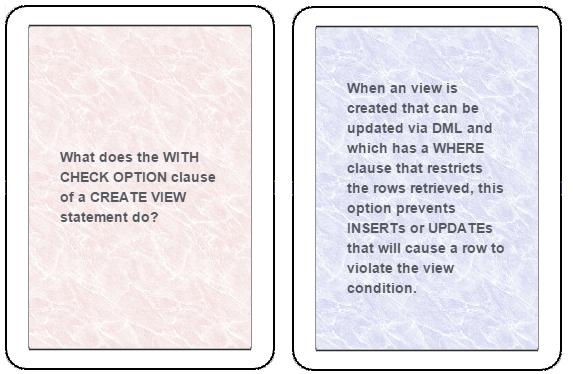 The 'question' component of flash cards would provide context and a mobile app would make an ideal delivery system. I liked the idea so much that I dropped everything in order to focus on the task of turning the concept into reality. It worked -- the first two OCPFlash apps are now available on Amazon. Each contains 200 flash cards for the 1Z0-061 and 1Z0-051 Oracle SQL Fundamentals exams respectively. In a few weeks when more apps are completed, they will all be released on the Google Play store as well as an iOS version at the Apple store. Currently the focus is on developing new flash cards as rapidly as possible. 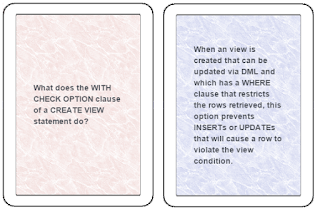 Flash card apps for more exams will be released as I have time to create the content for them. Eventually I plan to release OCPFlash for all of the exams that I have written practice tests for. To be clear, I highly recommend that certification candidates should NOT attempt to use the flash cards as their sole source for exam preparation. There is absolutely no way that all of the information required for any certification exam could be represented in flash cards. 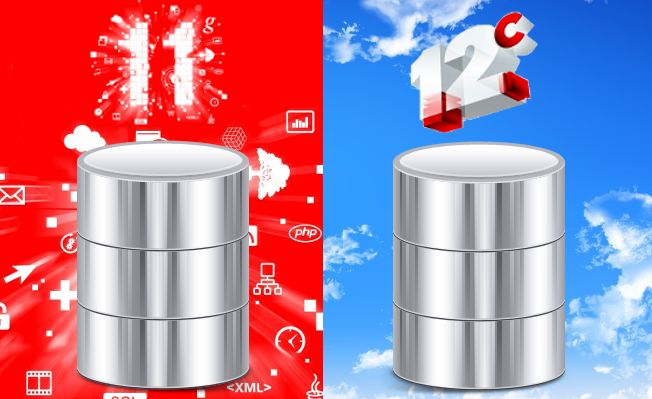 On the SQL Fundamentals apps, for example, the SQL statements used are considerably smaller than what candidates will see on the real exam. There is simply not enough room on a flash card for it to be otherwise. In addition, while flash cards are an effective way to assist with the memorization of facts, they are no help at all in other areas -- for example gaining experience writing and executing SQL. The image below shows an example of a question and answer set for the SQL Fundamentals exam. The flashcard app is $1.99 on Amazon. My vision of the role it would play in a certification candidate's preparation would be as an additional resource beyond whatever study materials they are already using. I believe that most people who use them will get a number of exam questions correct that they would have missed otherwise. If the app helps someone to answer even five or six more questions correct... in my opinion that is an excellent return on an investment of two bucks. In late November, I published a blog post announcing the release of four new Oracle Certification Prep practice tests for the Oracle 11g and 12c upgrade exams: 1Z0-050, 1Z0-055, 1Z0-034, and 1Z0-067. While I was focused on test generation, I decided to continue with development of practice tests to complement existing Oracle Certification Prep study guides. As with all of my practice tests, the price for the first take of the exam is $14.50. Retakes within a 60 window cost $11.00. I continue to receive very positive feedback from people who have taken my practice tests before the real exam. So far everyone that has contacted me has received exam scores on the actual exam that were very close to what they received on the Oracle Certification prep practice test. In October, Oracle announced they were offering exam vouchers at a 35% discount for their DBA upgrade exams through March 1, 2016. The discounted voucher offer covers exams 1Z0-060, 1Z0-067, 1Z0-034, 1Z0-050, and 1Z0-055. On November second, numerous Oracle professionals with Oracle 7.3, Oracle 8/8i, and Oracle9i Database credentials had their credentials inactivated until (and unless) they recertify in either 11g or 12c. The pricing model is the same as with all of my practice tests, with the initial take costing $14.50 and retakes within a 60 window costing $11.00. This is a better deal that you will find from any other vendor selling legitimate practice tests. The next lowest price would be $69.00 for 30-days of online access from Self Test Software. 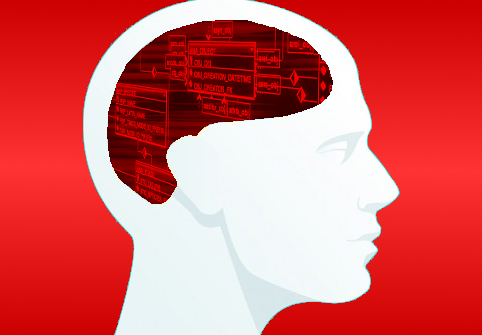 For that price, you can take a practice test from Oracle Certification prep six times. If you take a practice test more than three times in a thirty-day period -- the results will stop having any relevance regarding your knowledge of the material vs. your knowledge of the practice test. In addition, the 60-day window to qualify for the retake price means you have more time to work on fixing the weaknesses identified by the practice test. As with the existing Oracle Certification Prep practice tests, I have included a practice test discount code in the OCPrep study guides for each exam. I tried to come up with a reasonable way to allow previous purchasers of my study guides to provide proof of purchase so I could send them the code. Ultimately, I failed to come up with anything that made sense -- so I decided to open it up a bit further by starting my first ever 'begging for likes' campaign. This article is on the Oracle Certification Prep blog, and has been re-posted via the Oracle Certification Prep Linked in page. I will track (separately) Google +1's in the blog and LinkedIn 'Likes' on the LI Company page. If I get ten +1's on the blog, I'll post the code for one of the tests, at 20 I'll post the second, at 30 the third, and at 40 the fourth. Likewise, if the LinkedIn company page re-post hits 10, 20, 30, or 40 'Likes' I'll do the same. I will not combine the two (i.e. five 'Likes' and five +1's != 10). If this begging campaign succeeds better than I have any reason to expect it to (say either 100 likes or 100 +1's), I'll post a code that will provide a discount off any of the Oracle Certification Prep practice tests (i.e. not just these four). There are ten total right now (including the four new ones) and I have about six more in the pipeline at the moment, so it would cover a lot of different tests. How many certifications is too many? "I have way too many certifications already but taking the 12c OCP upgrade shortly." On reading that, my initial thought was to wonder exactly how someone determines the point at which they have too many certifications. Alternately -- how does an Oracle professional decide that they have too few? The critical goal though, would be figuring out what number represents the Goldilocks zone where you have exactly the right number of certifications. Unfortunately, when I checked out his LinkedIn account, Oracle certifications were not broken out individually on his profile. As a result, it was not possible for me to get a count of the number he felt had become excessive. Looking beyond the certifications section, his profile indicated a highly experienced Oracle professional, with seventeen years of experience as a database administrator, two stints as a presenter at Oracle events, and recognition as an Oracle Ace. From this, it is readily apparent that his goal in accumulating certifications is not demonstrating knowledge of the Oracle database to potential employers. If that were the case, presumably the credentials would at least be listed on his profile. Instead, his motive is almost assuredly related to a note in the 'Interests' section to the effect that he likes keeping current with Oracle technology. In fact, this is the same reason that I regularly take Oracle certification exams. I have just passed my second decade working with the Oracle database. Given my experience, no employer in the world would doubt my knowledge of Oracle even if I had never taken a single certification exam. By extension, adding new OU credentials to my profile is unlikely to make a noticeable increase in an employer's perception of my skills. However, taking an exam or two a year is an excellent means of ensuring that my Oracle knowledge does not become stale. The return on investment of earning a multitude of credentials is not the stack of certificates collected. In my case, that stack only sees the light of day when I open the file drawer to add another certificate. The value of any Oracle professional lies in how much they know and how proficient they are at applying that knowledge in the real world. At what point should an Oracle professional decide that they know enough about Oracle such that learning more has no value? To be clear, I certainly do not mean to imply a binary solution set exists: either earn certifications or stop learning. There are other methods for keep your skills current that do not involve pursuing certifications. However, they are certainly a convenient method for achieving this goal -- especially for something like the new features exams. So... in answering the question posed in the title, my opinion would be that an Oracle professional probably has enough certifications when they are two or three years from retiring. Until that point, I have difficulty believing that learning ever stops being worth the time and money invested. I had my opinions surgically removed years ago. That said, anything posted on this blog that bears any resemblance to an opinion is my own and not that of my employer or of Oracle Corporation. Copyright 2013 Matthew Morris. Awesome Inc. theme. Powered by Blogger.